As part of Outdoor Project's Women In the Wild series this summer, I have had the honor of working with outdoor women from all over the industry to dig a bit deeper into who they are, how they got to where they are now, how they approach the outdoors, and more. These women are all rad in their own right, regardless of where they come from, what they look like, or how "badass" they might be. Whether they're mothers, daughters, sisters, professional athletes, beginners, weekend warriors, "instafamous," or anywhere in-between, their unique stories, journeys, opinions, and perspectives are incredibly valuable and insightful as Outdoor Project - and the industry as a whole - progresses and evolves to become more inclusive to every type of outdoors person. Through in-depth and often thought-provoking interviews, I hope to highlight these women's stories, their work, their adventures, and so much more with an eye toward giving them their well-deserved share of the spotlight while inspiring and empowering even more women to get outside! In this feature we talk to Adriana Garcia. 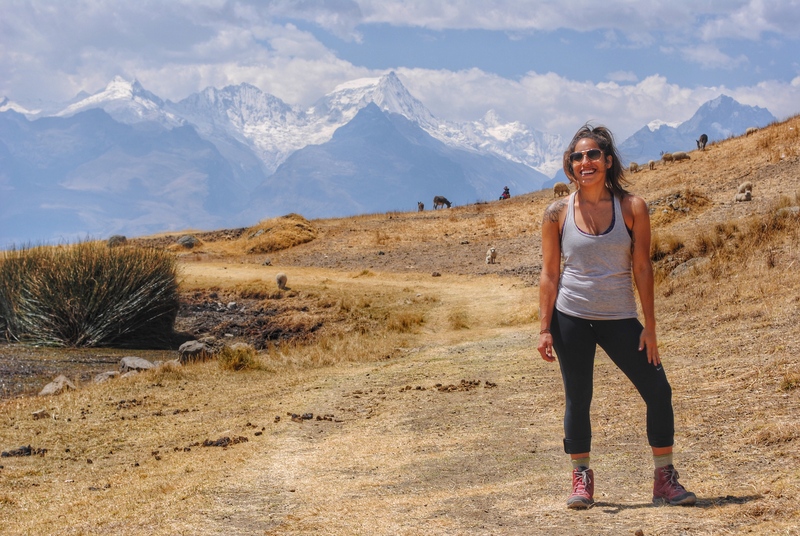 Long-time hiker, backpacker, camper, and all-around nature lover, this Woman In The Wild left her accounting job to co-found LatinX Hikers and work to create a more inclusive, equitable, and diverse outdoors community. There's no doubt that we need more people like her. Get the full scoop below. OP: Give us the skinny on who Adriana Garcia is. Adriana Garcia: I am a 30 year-old Mexican American with a long history of playing in the outdoors. I’m from a small town in Tennessee, but I currently live in Atlanta, Georgia. I’m an ex-accountant that co-founded @latinxhikers with my friend, Luz Lituma, last August. It is a community that focuses on promoting diversity, inclusion, and equity in the outdoors through social media and community outreach to help change the outdoor narrative. OP: When did you first know that you were going to spend your life in the outdoors? Adriana Garcia: When I was a little girl. I was one of those kids that never wanted to be inside. There was so much to do in the woods behind my house that being inside didn’t interest me. The outdoors has played a significant role in every stage of my life, so it only makes sense that it will continue to play that role throughout the rest of my life. OP: What does it mean to you to be a woman in the outdoor industry? Adriana Garcia: Being a woman in the outdoor industry means that I have to try harder to be recognized as someone that is “outdoorsy.” It’s gotten easier for people to believe me when I tell them I love backpacking, camping, hiking, etc., but I still get the occasional weird look or attempted “mansplaining.” Not only do I get some pushback for being a women in the outdoors, but also for being a women of color. Where I am from, women of color are not seen in the outdoors. Not on the trails or at the campgrounds. In the past, I felt the need to prove myself to others because I didn’t fit the mold of a “typical” outdoors person, but I’ve since stopped doing that. I find it easier to just connect with those people that doubt me and have them see for themselves who I am. OP: What has the outdoors done for you and how do you pay it back? Adriana Garcia: Where do I even start? When I was younger, the outdoors was a shoulder to cry on. A place I could escape to when my parents would fight or when I couldn’t get along with my brothers. It’s where my best friend and I had picnics, discovered uncharted land, and where we spent most of our free time. As a teenager, it was a place to have fun with my buddies and a way to experience freedom. It’s where I drank my first beer, rode my first dirt bike, and it’s where we had weekend campouts after a hard week at school. It’s where I’ve conquered some of my biggest fears and it’s also where I’ve had some of the most beautiful moments in my life. The outdoors has taught me how to be self-reliant, curious, appreciative, kind, and strong. I owe my life to the outdoors. I pay it back by staying curious and going exploring as much as possible. I also introduce others to the greatness of the outdoors in hopes that they will benefit from it’s wonders. Most importantly, I try and conserve and protect the lands that I utilize and try to educate others to do the same. OP: Conservation and protection of our public lands are central themes in today’s outdoor recreation narrative. As someone who spends a significant amount of time outdoors and on public lands, what role do you think outdoor enthusiasts should play in this evolving conversation and landscape? Adriana Garcia: I think that it’s our duty to play a large role in the conservation and protection of our public lands. If we are constantly taking from the land and not giving back, then there will be nothing left for future generations to explore. That means we are the ones starting those important conversations, learning more about what we can do, and educating others. It’s up to us to use our platforms and privileges to get the word out. OP: Who has inspired you along the way? Adriana Garcia: My parents. My mom is my biggest fan and supports everything that I do, even the wild ideas that I have. My papi has taught me to be self-sufficient and to work hard for the things that I want in life. Both of them love the outdoors in their own way and have taught me that it’s important to have a deep relationship with nature. OP: What does adventure mean to you? Adriana Garcia: Adventure is what I live for. It means letting go of fear and instead, leaning into the discomfort. OP: What does the term "badass" mean to you? Adriana Garcia: A badass is someone that is not afraid of taking risks and who is able to stare their obstacles right in the face and figure out how to get around them. It’s also someone that fully embraces themselves, the good and the bad, and doesn’t give an F if people like them or not. OP: What mantra or set of words do you live by? Adriana Garcia: "When you know better, you do better." OP: In a perfect world, what does the outdoors (the people, the places, the community as a whole, etc.) look like to you? And what can outdoor brands and media companies, such as Outdoor Project, do better to help get us there? Adriana Garcia: The people are diverse. The places are more easily accessible, preserved and well taken care of. The community is more inclusive and educated on conservation practices. We are a part of a coalition of people that are working to diversify the outdoors called Diversify Outdoors. They clearly state what outdoor brands and media can do to diversify the outdoors, and I stand behind these statements 100 percent. Hire LGBTQ models and athletes of color. If you have diverse brand ambassadors, make sure you include them consistently in your visual marketing efforts like videos, photos and other promotions. Include people of color, LGBTQIA, women, varied body types and abilities in your ads. Ensure that your advertising is representative of real Americans and not just a select few. Identify diverse social media influencers who can help your brand broaden your engagement and consumer base. Prioritize diversity within your company from entry level staff to senior executives. Diversifying your hiring practices will allow you to connect with a rapidly diversifying demographic, increase market share and avoid embarrassing advertising gaffes. Work with diverse ad agencies to craft consistent, inclusive, and dynamic ad campaigns. As far as conservation of these outdoor places go, you can continue educating people and encouraging people to treat the outdoors with respect. You can also be a good example by backing and donating to organizations that are working directly with conservation. OP: What is one thing that you never leave home without? Adriana Garcia: My phone, of course. But also my journal. OP: Let’s talk gear - what are your thoughts on women-specific gear? Love it, hate it? Are there any companies out there doing it right? And how so? When does it matter to you most to have gear specific to women versus unisex products? Adriana Garcia: I’m a fan of women-specific gear. I think it’s important that we have certain types of gear that are fit for women’s bodies such as backpacking backpacks but other pieces of gear that remain neutral. I recently got a Deuter backpack that was women-specific, and I noticed how much more comfortable it was then other backpacks that I have. But also, I feel like gear is often pushed onto us as if it’s necessary for doing outdoor activities. It’s expensive and makes it intimidating for someone that wants to get into an outdoor activity and doesn’t know where to start. We tell people that come to our hikes that all you need is comfortable clothing, close-toed shoes, and a water bottle. They don’t need fancy hiking boots or tech tights to get outside. I feel that the conversation around gear needs to change and that it needs to be made more easily accessible for EVERYONE. OP: What is the greatest piece of advice or direction that you’ve ever received, and what’s the story behind it? Adriana Garcia: Do what makes you happy. There is no real story behind it, only that my dad told me this when I was younger, and ever since it’s been stuck with me. Being that my dad immigrated here from Mexico with no education or resources, it made it difficult for him to find a job that made him happy. He wanted more for his children and wanted us to enjoy our lives and the work that we do. OP: If you could give one piece of advice to yourself when you were just starting out with LatinX Hikers, what would it be? Adriana Garcia: Don’t be so hard on yourself, and don’t be afraid to say no. There were a lot of times that we were overexerting ourselves because we felt like we had something to prove, but we realized that to do a good job at what we’re doing, we have to say no sometimes. We are also our own biggest critics and come down on ourselves a lot when we need to be praising ourselves. It’s all a learning experience, and we are constantly growing. OP: In a world seemingly run by online personas, how do you approach social media, and how does it play into your lifestyle - both work and play? Adriana Garcia: Before creating @latinxhikers, I was completely anti-social media and avoided posting personal things. I also didn’t like being on my phone and taking myself out of the moment in order to post on social media. But obviously for me to be able to manage an Instagram, I’ve had to change that outlook some. I’m more open with what I share on social media, and now I try to set aside time to be on my phone and time to put it down. I never want social media to influence me so much that I lose myself, so I try to stay balanced. OP: What’s next for you in the coming months and years? Adriana Garcia: I plan on focusing all of my time on @Latinxhikers and helping it grow as a community. I’m trying to put off getting another full-time job until I find something that I really want to do - like work in the outdoor industry. OP: Tell us one thing about yourself that no one knows. Adriana Garcia: When I was senior in high school I decided that I wanted to be an actress, so I started my first year of college as a theater major. That didn’t last long. OP: If our readers were to take one thing from this interview, what would you like it to be? Adriana Garcia: That the outdoors belongs to everyone, so let’s make everyone feel welcome and teach them how to conserve it. Learn more about Adriana by following her on Instagram, and check out LatinX Hikers both online and on the 'gram.